Call it being conservative or scatterbrained, but any way you look at it Apple is far behind competitors in the streaming media player department. The 4th-generation Apple TV was an upgrade from previous models, for sure, with improvements like 60fps, Dolby Digital 7.1, and voice search, but while other companies like Roku, NVIDIA, and Amazon were upgrading their players to handle 4k and HDR, Apple was busy touting all the TV shows, movies and games playable on Apple TV. Most analysts expect Apple to announce the new Apple TV will support 4k content, that is, 3,820 by 2,160 pixels of resolution (4-times that of 1,980 x 1,080), but what might be even more critical is support for HDR content, hopefully, in both HDR10 (the open standard) and Dolby Vision (a proprietary format) that expands the color range, contrast, and details in images. But what good is the Apple TV if iTunes doesn’t sell any 4k content? We also expect Apple to announce a new format in their Movies and TV Shows store that sells Digital UHD with HDR (whether or not the Digital UHD format will follow Vudu’s use of Dolby Vision and Dolby Atmos in Digital UHD files is up for grabs). The 4k content will be pricey though. 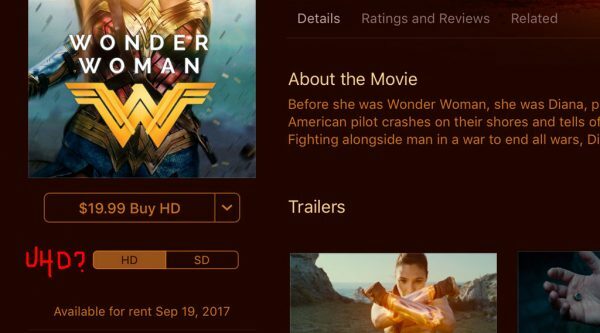 You can bet most blockbuster titles will be priced $29.99 (the going rate), albeit with Apple’s iTunes Extras that include bonus materials such as deleted scenes and production featurettes. A couple good things have already happened for Apple TV leading up to their 5th-generation model announcement. The Vudu app finally launched for Apple TV (one way the device could stream 4k/HDR), and Amazon Video is expected to expand features on iOS devices (you still can’t purchase titles on the app) and launch on Apple TV (we’ve been waiting a long time for this). In addition, Amazon.com may even start selling Apple TVs again (they were pulled from the web retailer in 2015). What will the 5th-generation Apple TV cost? Apple needs to redeem themselves with an affordable 4k media player if they want to compete with Roku, Chromecast and Fire TV. Roku’s Ultra player costs half the price of the $199 Apple TV, and does both 4k and HDR! The 5th-gen lower-tier Apple TV model should be priced at $99, but it won’t be. It will likely be priced $149 — the same as the 32GB 4th-generation model except with 4k/HDR. Think about it. Apple is probably going to sell a $1k iPhone (the “X”), and people will buy it. Why should they lower their price for any of their products? Other things to look forward to with the new 5th-generation Apple TV are the design (will it be smaller? sleeker? less sharp on the edges? ); HomePod integration (the smart speaker ships in December); and, a new remote control (although don’t expect Apple to bail on their ultra-sensitive touch pad design. If anything, expect it to do more).